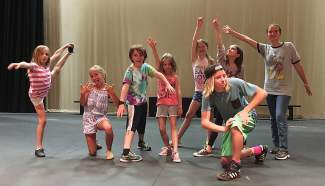 Every summer, Vail Performing Arts Academy cast members break into teams and choreograph their own dances in a spirited competition on par with âSo You Think You Can Dance.â This yearsâs winning team was The Sparkles, led by the ever-remarkable Finn Dippy. Come see all the cast Aug. Friday and Aug. 6 in Xanadu, Jr at Vail Performing Arts Center. Call 970-845-TIXS or visit www.vilarpac.org for tickets.